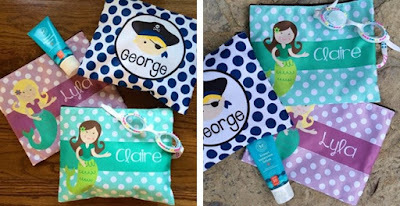 Right now you can get an adorable Personalized Pool Bag for $9.99 (Retail 18.50)! This would make great party gifts. One of our biggest sellers from last year is back in a new BIGGER size to hold more! These 10"x8" personalized bags are the perfect way to corral sunscreen, goggles, keys and cell phones for your trip to the pool or beach. Such a great way to protect and organize your smaller items in your larger pool bag! There are 42 darling styles to suit everyone's taste -- from toddlers to adults! They are made of a durable polyester and cotton interior with the design printed on both sides and an additional interior zippered compartment. They easily wipe clean and are machine washable on the gentle cycle. $3.95 for the first item and $0.75 for each additional item. US only. Estimated to ship by Jun 24.